LUTZ, Florida — Idlewild Baptist Church is one of the country’s 50 largest churches, located in the Tampa, Florida region with ministries that serve its parishioners who range all the way from preschool to seniors. As part of its continued outreach to the region’s worshippers, Idlewild Baptist Church recently performed a complete renovation of an abandoned, church to create a multipurpose facility that could be used by the community seven days a week. 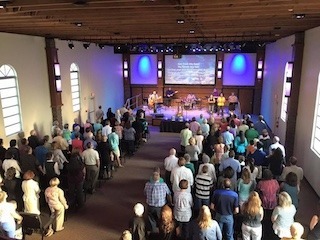 Springfield, Missouri integrator Paragon 360 handled the entire renovation of the church’s interior, which including outfitting the space with a comprehensive, state-of-the-art HARMAN Professional audio system. The church required an audio system for sermons and the praise band that could handle the needs of local artists who might come in to perform. “Church management also wanted a system that would be easy to use by church volunteers” stated Mark Coble, Audio/Acoustics Design and Commissioning Specialist at Paragon 360. Paragon 360 installed two JBL AM7315 loudspeakers as the main left and right, along with two JBL AM5212 delay loudspeakers in the balcony and a JBL ASB7128 subwoofer. In addition, two JBL STX812M stage monitors round out the loudspeaker complement. Coble chose these specific models based on their power handling and SPL capability, pattern control and coverage. Also, the church requested that the system would have the capability of being operated in stereo and Coble needed loudspeakers that would deliver a focused stereo sound field. “Our biggest challenge was that the church did not want any acoustic treatment on the side walls, so we had to overcome the acoustics of what was essentially a rectangular box with hard surfaces,” said Coble. The church staff wanted to preserve the original open wood ceiling and rafters and their rustic look. They let Coble design acoustic treatments to hang high up in the rafters to control excess low-frequency build up, “but there was still a considerable amount of flutter, and between the left and right walls the room’s intrinsic amount of flutter is very noticeable. However, the loudspeakers are able to overcome much of the room’s acoustic problems amazingly well and the JBL models we chose deliver extremely high speech intelligibility.” By using this particular combination of loudspeakers, he notes, the system is able to provide coverage to the seating area while avoiding the degradation that would be incurred by sound bouncing off the walls. “The church is small, but it is a unique space and we wanted to do a lot in there. The interior build out with Paragon 360 scenic elements came out looking absolutely beautiful and although we were concerned about the acoustical constraints, the system sounds superb and is exactly right for the space,” added Coble. For more information on Paragon360 please visit: www.paragon360.com.